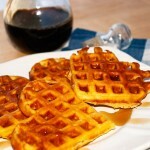 Breakfast waffles with a twist. On Sunday mornings, my family loves to have a special breakfast. It gives us time to talk about our week, read the paper with an extra cup of coffee and eat delicious food. There is nothing better than hot waffles, melting butter and fragrant maple syrup dripping down the stack. I prefer US grade A dark amber syrup. It is stronger and has a more intense maple flavor than the medium amber syrup. 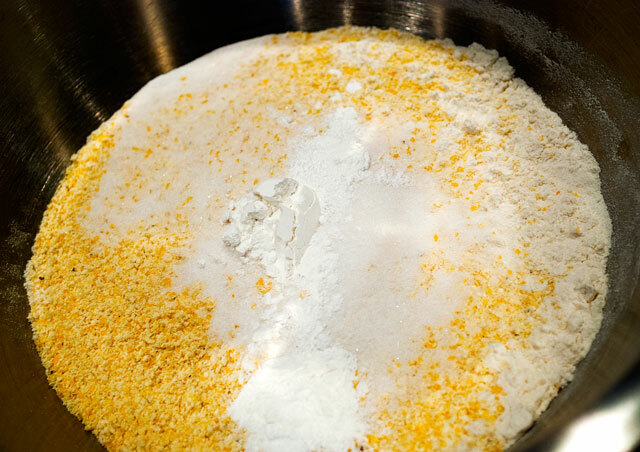 Place the dry ingredients into a large bowl. 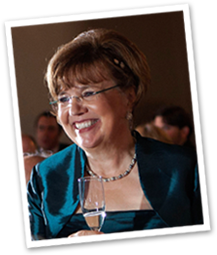 Bob’s Red Mill carries a great line of grains that is widely available in most food markets. His medium grind cornmeal has just the right amount of finely ground meal as well as small bits of the whole corn kernel (the germ). Beat together the eggs and the milk. Melt the butter. Add the milk mixture into the dry ingredients and stir until there are no lumps. 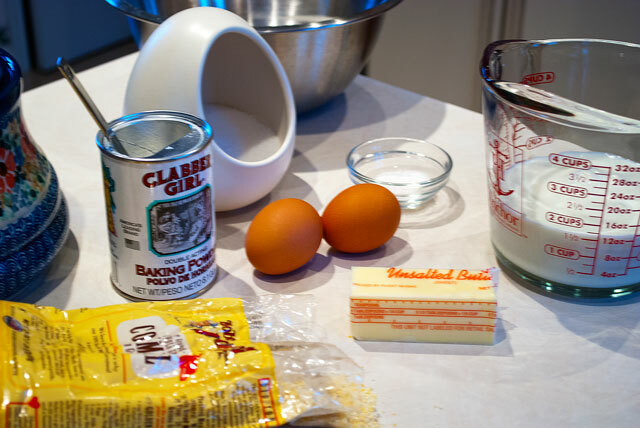 Don’t over mix in order to avoid developing the gluten. Fold in the melted butter. Ladle batter onto the preheated waffle iron. Cook until the iron beeps. Note: If you have any waffles left over, the best way to reheat them is in a toaster. Microwaving will toughen them, the oven dries them out and wrapped waffles in the oven will steam and get soggy. 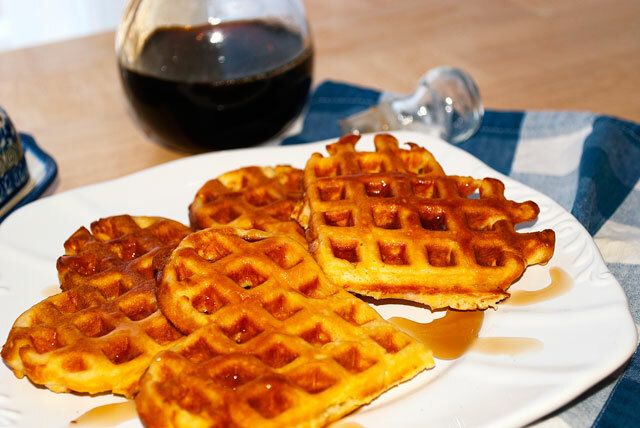 Delicious breakfast waffles with medium ground cornmeal for added texture. Preheat your waffle iron. Apply melted butter or cooking spray as needed. Place all dy ingredients in a large bowl. In a separate bowl, beat the eggs and the milk together. Pour the milk mixture into the dry ingredients. Mix together until there are no lumps. Be careful not to over mix. Fold in the melted butter. Allow the batter to sit for 5 minutes. 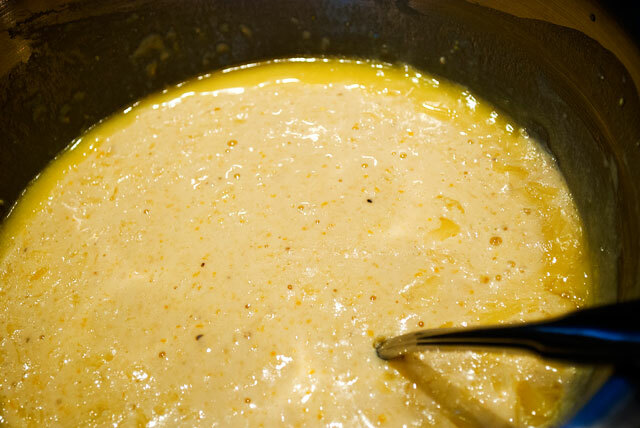 This gives the cornmeal time to absorb the liquids. Ladle the prepared batter onto the waffle iron. The amount will depend on the size of your iron. Cook until the waffle iron indicates the waffle is cooked.